The slowdown is expected to be felt by 70 percent of the global economy, including the US, EU and Japan, as well as major emerging economies, although China is a notable exception to the broader trend. With overall risks tilted to the downside, the gloomy outlook has sparked immediate responses in safe haven assets, with Gold finding comfort above the $1,300 mark. The US Dollar may react to some near-term catalysts in the form of the pending March US inflation print, the minutes from last month’s surprisingly dovish Fed meeting, and Fed chair Jerome Powell’s speeches over the next three days. Should any of these events support expectations of a Fed rate cut, the Dollar Index (DXY) could sink back towards 96.80. However, any drop would likely be mitigated by the worsening global outlook, which is offering support for the Greenback. EURUSD bounced off the 1.12 support level in the lead up to the European Central Bank’s latest monetary policy decision due Wednesday. Mario Draghi and his fellow policymakers are expected to sit on their hands this month, with little room to maneuver amid significant headwinds. While political tensions in France and Brexit uncertainties are beyond the central bank’s control, these factors have been highlighted by the IMF as putting downward pressure on growth, leaving the ECB to bide for time and watch how these risks manifest into the real economy. 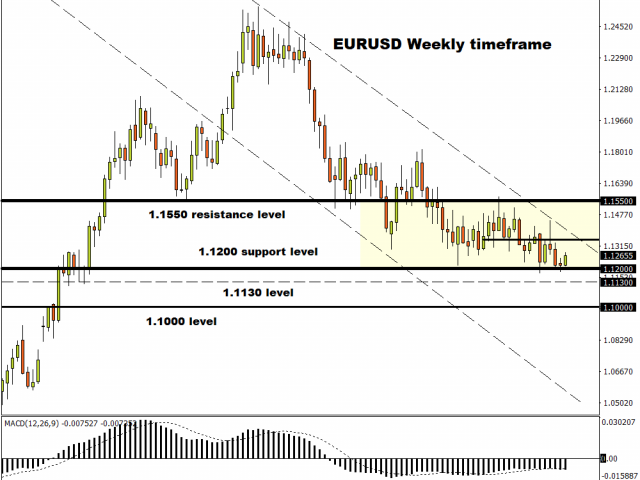 Taking a look at the technical picture, the EURUSD remains in a bearish trend on the weekly charts. There have been consistently lower lows and lower highs while the Moving Average Convergence Divergence (MACD) trades to the downside. A solid breakdown below 1.120 has the potential to encourage a move lower towards 1.113 and 1.100, respectively. If 1.120 proves to be a reliable support, the technical bounce is seen taking prices back towards 1.135. Pound traders have narrowed the trading range for GBPUSD to between 1.30 and 1.31, even as markets remain on tenterhooks, awaiting the next development surrounding Brexit. The EU is set to hold an emergency Brexit summit on Wednesday, amid expectations that the UK will be told to delay its exit by up to a year. It remains to be seen whether such a demand is palatable for UK lawmakers and Prime Minister Theresa May, whose request for a short extension to the 30th of June was rejected. While a longer extension may avoid stringing markets along with a series of cliff-edge dates, it still doesn’t remove the overall uncertainty as to how and when the UK will exit from the European Union. This implies that the dark clouds of Brexit won’t be clearing up anytime soon, which should continue weighing on the Pound throughout the rest of 2019. 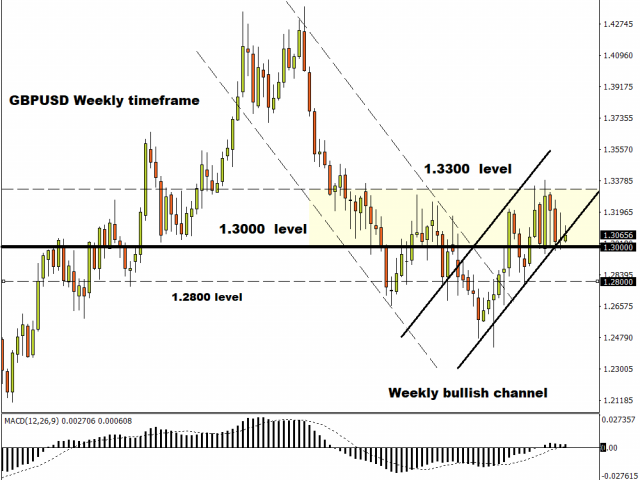 Focusing on the technical picture, the GBPUSD is struggling to keep above 1.3000 on the weekly timeframe. A decisive breakdown and weekly close below this point is likely to open the gates towards 1.2800 in the short to medium term. ← Will the ECB push the EUR/USD below 1.1200 today?